When it's time for babies to start on solid foods, many families turn to pre-packaged baby food to feed their little ones. Although fresh foods are usually more nutritious, it's not always possible to make fresh baby food every time your baby is hungry. Families rely on baby food jars, cans, or pouches for feeding on-the-go, either for convenience or because it's what fits in their family budget. To many, baby foods are a pretty healthy option, with many brands offering low-sugar, organic offerings that boast plenty of nutrients and vitamins that your baby needs. Plus, it's easier than ever to get vegetables into your baby's diet thanks to the increasingly creative blends of baby foods. Unfortunately, although many families rely on baby food to feed their baby and see it as a healthy option, research from the Environmental Defense Fund (EDF) has revealed that many baby foods on the market contain levels of lead that are unsafe for babies. Lead was found in 20 percent of baby food samples, as compared to lower levels (14 percent) found in other types of food. 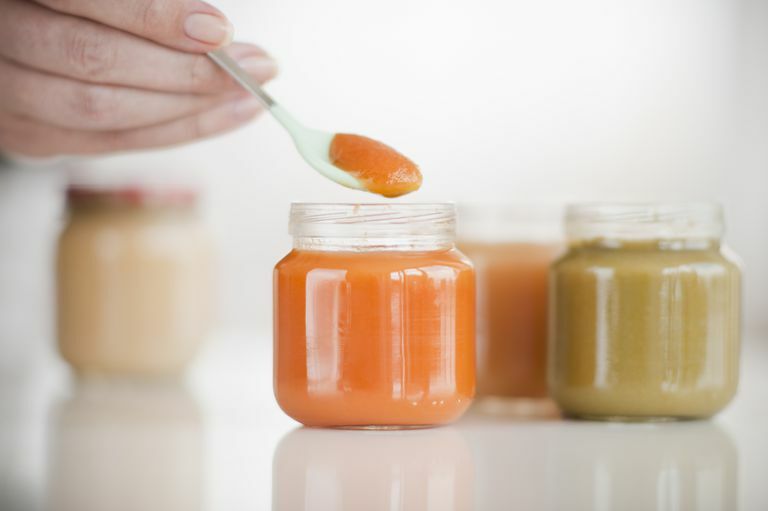 Eight types of baby foods in particular had lead in more than 40 percent of samples. Baby food containing apple and grape juices and carrots had more lead than regular versions. Grape juice for babies had the highest amounts of lead among the other juices analyzed. The top offenders for baby food with lead were root vegetables of sweet potatoes and carrots, as well as cookies, including arrowroot cookies and teething biscuits. Rice cereal also had high levels of lead. Separate from the EDF's study, the EPA has reported that more than 1 million children are consuming lead levels that exceed the FDA's limit of safe lead consumption of 6 micrograms per day. While the lead levels found in baby food in the EDF report did not exceed the FDA limit, both the EDF and EPA note that there is really no known safe level of lead in the blood, so any consumption by children is considered to be dangerous. Lead consumption is linked to behavioral problems and lower IQs in children because of the damage it inflicts on the developing brain. This is a danger to children and can lead to expensive medical conditions as well. For example, they explained that eliminating lead in food would not only lead to children having more healthy lives, but would also save society billions of dollars every year in earnings and medical expenses that result from the effects of lead poisoning. Lead poisoning can have many early signs and symptoms, such as irritability, headache, stomachache, being jittery, difficult concentrating, and a poor appetite. Once damage from lead has occurred, it can not be treated or reversed. If you're concerned about excessive lead levels in baby food, consider making your baby's food at home and avoiding canned baby food. Making a large batch of baby food at once and freezing it in a ice cube tray or special baby food containers can help cut down on food preparation time. Fruit juice should be avoided, not only because it was the highest offender for lead, but because fruit juice is high in sugar and does not offer any nutritional benefit over fresh fruit. The American Academy of Pediatrics also recommends that infants under the age of one should not have juice of any kind. You should also make sure that your child has all of his or her well-child visits on time to screen for any possible delays that could be caused by lead toxicity. Most pediatricians will also do a blood level of lead at their 1-year check-up, so be sure to talk to your doctor about what the results of that test show. If your child's lead levels are too high, you can make a plan for reducing their exposure to lead. Research into baby food has revealed that many types on the market contain levels of lead that could be dangerous for children to consume. Baby foods that contain sweet potatoes, carrots, or apple and grape juices tend to have the highest levels of lead. If you can, consider making fresh baby food at home to reduce your child's exposure to lead and talk to your pediatrician about how to limit lead consumption.